Remote sensing applications in water resources domain provides key inputs for for planning, monitoring and management of several irrigation projects, estimation of availability of surface water resources and various water balance components and as a science application addresses all the hydrological components of local and regional water cycle. Several projects were executed by NRSC on the performance evaluation of irrigation commands and irrigation potential utilization, assessment of irrigation infrastructure across the country, space inputs for feasibility studies for Inter Linking of rivers, reassessment of water resources at river basin level, reservoir sedimentation, seasonal snow and water bodies information, snow melt runoff etc. 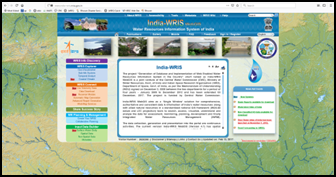 The strength of dynamic multi-sensor / satellite based information is providing scope for the development of water resources information systems at state / central level. These information systems are better focused for organization of water resources related database, collection and integration of field data, dissemination to teh stake holders for analysis and preparation of water management plans. Institutionalization is being done for various state / central govt. water resources organisations.